An afterlife comedy, Beetlejuice takes the side of a ghostly couple haunting their own home, and the new perspective generates plenty of clever laughs. Adam and Barbara Maitland (Alec Baldwin and Geena Davis) are spending an idyllic vacation in their gorgeous but slightly spooky Victorian New England home. An unfortunate car accident leaves them both dead. They return to haunt their home, but their placid ghostly existence is disrupted by new owners. Bickering couple Delia and Charles Deetz (Catherine O'Hara and Jeffrey Jones) and their daughter Lydia (Winona Ryder) are an annoying presence, and Adam and Barbara start the process of learning how to create enough of a nuisance to drive away the new arrivals. Beetlejuice (Michael Keaton) is a hyper-kinetic rogue ghost, and he offers his services to the Maitlands as a specialist in scaring off the living. Delia starts to redecorate the place with the help of her insufferable interior designer Otho (Glenn Shadix), while Charles just wants to be left alone to relax. Lydia despises her parents and is into the dark scene, and this allows her to see and befriend Adam and Barbara. With scare tactics not really working, Adam and Barbara have to decide whether Beetlejuice is more of an asset or a liability, while Lydia has to accommodate two friendly ghosts into her lonely life. Beetlejuice is briskly paced, funny, and with just enough self depreciation to maintain a light-hearted mood. Director Tim Burton creates a vivid alternative reality where ghosts are the rightful tenants and the living are the intruders, the ghosts experiencing their own sense of entrapment with massive earthworms preventing their leaving. Adam and Barbara also discover that the world of impenetrable user manuals and bureaucracy follows them to the afterlife, with the most imaginative scenes unveiling the world of the dead clogged with paperwork, bored secretaries, overburdened case workers and crowded waiting rooms experiencing long wait times. Alec Baldwin and Geena Davis make for a cute couple, and their transition into ghosts is handled with a dry matter-of-factness. Winona Ryder steals the film as the dark, curious goth teen, her willingness to explore new dimensions allowing her to see spirits invisible to others. Ryder acts with eyes that are defiant, questioning and brave, and she gives Lydia the inner steel needed to tolerate her parents. Compared to the aggravating Charles and Delia, a couple of ghosts are easy. Michael Keaton lets loose with a high energy, berserk role as Beetlejuice, a wound-up ghost covered with layers of decaying make-up and powered by the uniquely irritating sensibility of a desperate used car salesman. 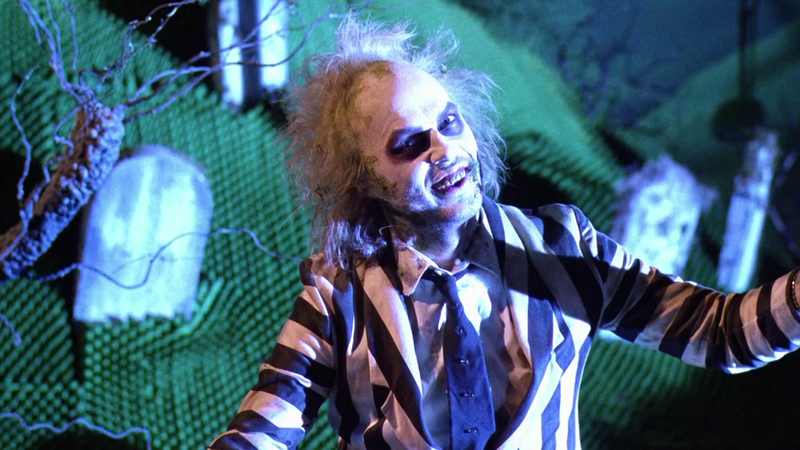 Beetlejuice's antics are the driving force behind most of the special effects in the film, state of the art for 1988 and still impressive in a modern context. A gigantic snake headed by Beetlejuice is the slithery highlight. He may be a loudmouthed and unmannered boor of a ghost, but Beetlejuice knows how to have fun among the living.